Larry Tolliver moved to Oildale when he was in the sixth grade, after being raised in the Rosedale area. He entered North High in 1958 as a rather chubby 13-year-old, not knowing a soul. He went out for freshman baseball and never got to play in a game, although he practiced with the team every day. Discouraged, he didn’t even try out as a sophomore, but instead offered to be the student manager for the C-Class basketball and track teams. As a junior, he watched the JV basketball team and was convinced he could help the team that was, in his words, “lousy.” Coach Lloyd Williams advised him to try out as a senior as it was already too late in the season. So again, he went out for JV baseball, convinced he was as good as some of the other players, and made the team. At the start of his junior year he was 5’9” with huge feet and hands. By the time baseball rolled around he had sprouted to 6’0” and Coach Sam Barton liked what he saw in him. Before the season was over, he was the team’s #1 starting pitcher, surprising everyone. When the 1961 school year rolled around, there’s this tall dude walking on campus. It’s Larry Tolliver who had he grown an unbelievable seven inches in a nine-month period and now stood 6 ft. 4 inches tall! Varsity basketball coach Tom Bailey wisely named Tolliver his starting center, though he had almost no basketball experience under his belt. 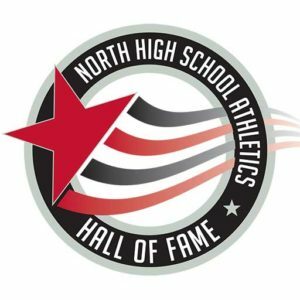 He was surrounded by one of the best teams in North High history, playing with a lineup that included juniors Ray Ermigarat, Larry Hudson, Roger Palmer and Paul Crissman. The basketball story would not end with that season. He was a key starting pitcher on the varsity baseball team that year under Coach Bob Russell. They had a very good team, but failed to win the league championship. And the baseball story doesn’t end there either. • Was 1963-64, Most Improved Player, averaging 15 points a game. • Was 1964-65, MVP of the basketball team. • Was the leading scorer (20 ppt) and rebounder (15 per game). • Scored 37 points in a game against Pasadena, 2 points shy of the BC school record that had stood since the early 50’s. • Made second-team All-Metropolitan Conference and was selected for the Conference All-Star Game. Not bad for only three years of organized basketball. Tolliver went out for baseball at BC and, in his second season under Gerry Collis, he was brought into a game for a save against Santa Monica. After securing the win for BC, the San Francisco Giants’ scout George Genovese came up and asked Larry if he was interested in playing professional baseball. Major league baseball held its first amateur draft in 1965 and Tolliver was picked by the Giants on June 8, 1965. He would pitch for five seasons in the Giants organization, making it as high as AA before an elbow injury sidelined him in 1970. During his pro career, he pitched two no-hitters. The first came in 1966 in which he struck out 13 and walked four, yet lost the game 3-2. Then, in 1967, playing for AA Waterbury, Conn., he cranked up another no-hitter against York, Pa., but this time winning 6-0. Only a leadoff walk in the top of the seventh inning kept him from a perfect game. His best memories of North High were getting a chance to play for great coaches like Lloyd Williams and Sam Barton, who saw something special in him as a young man. They were right on. In 1967, Tolliver married Tommie McMahon and they had two sons (Mike and Mark) that also graduated from North High. Both played baseball for Tony Silver.